Hopefully those of you in the tri-state area will have dug out from the record snowfall by Thursday, March 11. That's the date of the first Gluten Free Philly dining event, to be held at Casona in Collingswood, New Jersey. I collaborated with the restaurant to choose a day that seemed to work for the majority of people expressing interest. Fear not - if you can't make it that evening, I hope to plan other events down the road. I'll post the details and the special menu for the dinner next week. On Monday, I posted my review of Stephen Starr's impressive pan-Asian restaurant Pod in Philadelphia. I shared the news on Tuesday that Whole Foods has discontinued its 365 Brand gluten-free baking mixes. Vaders Bar & Grill in Southampton (727 Second Street Pike, 215-953-7575) has a gluten-free menu that includes appetizers, pastas, entrees and Redbridge beer. The kitchen uses separate color-coded pans, mixing bowls, tongs and spoons to prepare gluten-free items. An addition to the gluten-free dining mecca that is Collingswood is IndeBlue (618 Collings Avenue, 856-854-4633), which Philadelphia magazine named the best new Indian restaurant of 2009. All of the restaurant's entrees and salads are gluten free, as are several appetizers, the pudding and ice cream desserts, and all soups except for the mushroom and chicken variety. With at least one day's notice, the chef will also prepare gluten-free bread made of rice or chickpea flour at no additional charge. Glenny's, which brought you gluten-free marshmallow-rice bars and oatmeal cookies, has added to its stable new Fruit & Nut energy bars. The all-natural bars, which come in four flavors - Cranberry & Almond, Cashew & Almond, Fruit & Nut Classic and Mixed Nut - are sweetened with honey and brown-rice syrup. The next meeting of the Mercer County Celiac Support Group is scheduled for Wednesday, February 24 at the Whole Foods Market in Princeton. E-mail Liz Sowa for more information. The Chester County GIG meeting originally planned for February 10 has been rescheduled for February 24, from 7:15 p.m. to 8:30 p.m. at Chester County Hospital's Fern Hill Resource Center. A vendor fair will precede the meeting at 6:30 p.m. For more information, e-mail Nancy Artus or call 610-518-5572. The new Plymouth Meeting Whole Foods Market will host a free "Gluten-Free Wellness Talk and Tour" on Thursday, February 25 from 6 p.m. to 7:30 p.m. The store tour will follow a talk by Maura Shenker, a holistic health counselor. Call 610-832-0010 to sign up or stop by the Customer Service Booth. Finally this week, I wanted to mention that Passover specialty foods are now making their way onto supermarket shelves. With Passover comes the arrival of many gluten-free items not otherwise available year-round. 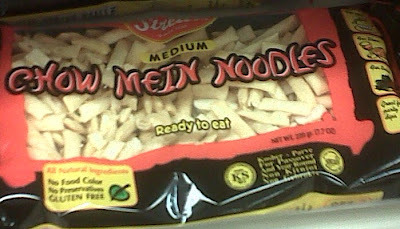 I'll be writing soon about some of these products, but I wanted to provide you with a sneak peek at one item - gluten-free chow mein noodles (in medium and wide sizes) from Streit's, which I spotted at my local ShopRite. Your blog has been a great find! I hope to make it to the dinner!